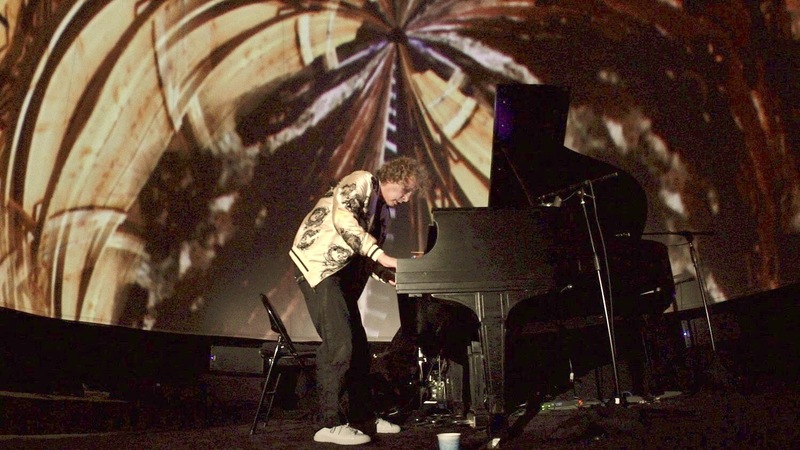 LOS ANGELES (Hollywood Press Corps) — Saturday, November 11th — Emmy award winning song writer, musician and inventor Peter Manning Robinson played a sold out performance at the mind bending performance space known as the Vortex Dome Los Angeles. This event was presented by Vortex Immersion Media and located at the LA Center Studios campus in downtown Los Angeles. This was a chance to experience Peter Manning Robinson’s Refractor Piano. 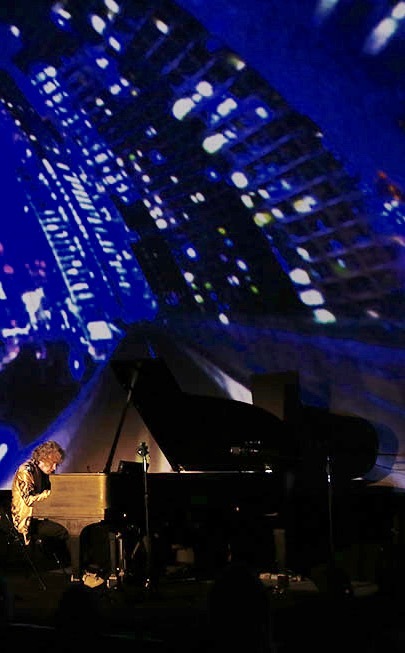 The Refractor Piano is a life long passion project by Mr. Robinson. Without using any outside beats or samples, Peter creates original compositions that layer the piano’s sounds into an avant guard auditory experience that is unique and innovative. Peter’s performance on Saturday was rich in improvisation. 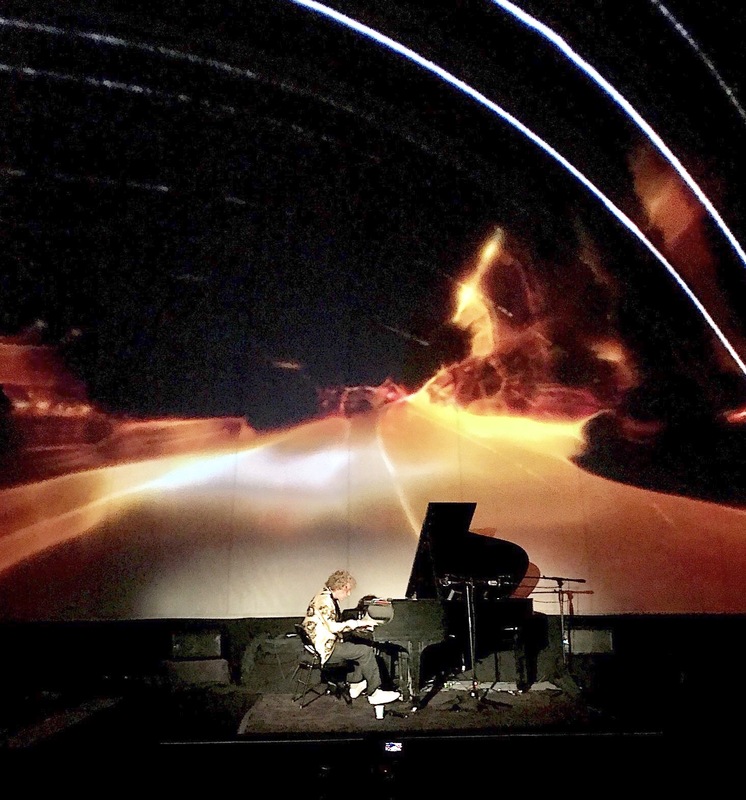 Adding to the sounds of the grand piano were Hana Kim’s layered video images. These images were projected into the dome which creates a 360 degree experience. Also on hand at the sold out event was Klaus Hoch. Klaus works closely with Peter on developing the Refractor Piano as well as being the creative director for the project. Peter began each original composition with a short story of what the song was about. He spoke about how he came to write each piece and what the piece means to him. We were lucky to be in attendance of the rare American Composer. In the tradition of avant guard composers like Aaron Copland and Frank Zappa, Peter uses his Steinway piano to record and loop traditional playing, but also uses mallets to play directly on the strings themselves. Once a rhythm is made, Peter can play and layer classical and jazz style piano into this composition. The first original composition of the night was very intense and urban called the “Iron Road.” Hana Kim’s visuals took us on a journey to a far away city where we seemed to endlessly drive through a city scape. Peter assembled a piece that showcased his playing ability and passion. The first piece was full of energy. The visuals and sounds hold the audience in a different place. The Vortex Dome Los Angeles allows you to look all around. Peter transcends a typical piano performance. The second piece of the night featured owls. Peter spoke about the owl and its mythological significance to tribes. Peter spoke of his love for owls. He said he can refract the sounds of owls that live on his estate and play that refracted sound back to them! “Owls of the Night” was the piece that Peter created right in front of us. A bit more mysterious and subdued than “Iron Road,” I thought this piece really showed off the capabilities of the Refractor Piano. Hana Kim’s visuals were stunning. There was a combination of owls flying and owls looking into your soul. The owls seemed to move perfectly with the soundscapes that Peter created. 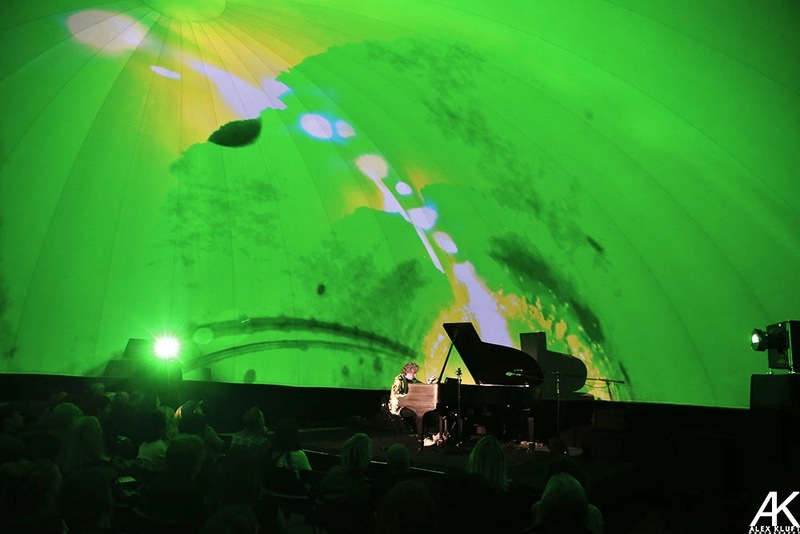 This was a beautiful composition and the immersive Vortex Dome really added to Peter’s performance. Peter took the time between tunes to explain how he became a musical voyager. Listening to these stories set up the entire piece. “Dancing in the Purple Sky” is a song that Peter created deep in the Kauai rainforests of Hawaii. Peter said that the tree frogs could create a sound that was 130 decibels. The song that Peter created is more of a straight piano tune. Its chords modulate up and down in a pleasant jazz pattern. This piece was one of my favorite tunes. If “Dancing in the Purple Sky” was my favorite straight piano piece, “Precipice” was my favorite Refractor Piano piece. “Precipice” is a piece that Peter wrote about the obstacle that people go through in their lives and how we overcome them. Peter starts this piece with echoing high piano notes seeming to cascade down into a chasm. These sounds are paired together with notes that sound like cellos countering the downward spiral. This is an amazing piece of music created by a modern American composer. American composers are in short supply these days. 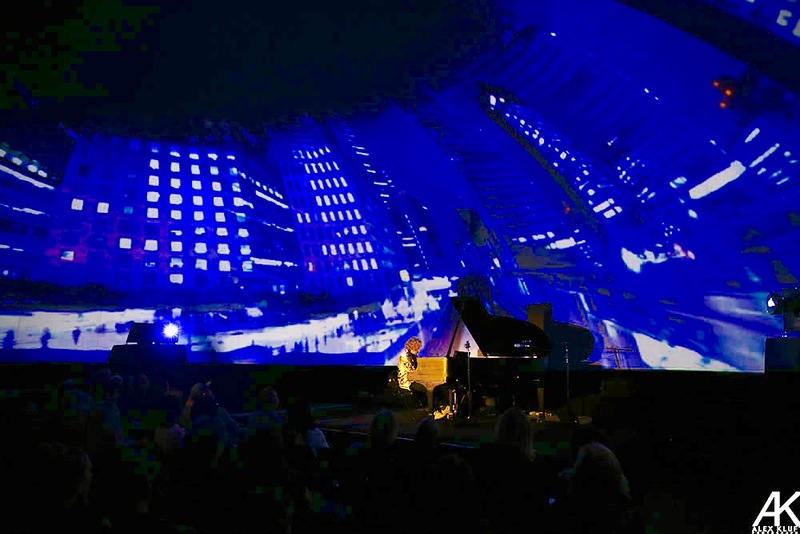 It’s great to have a local Los Angeles composer who has crafted music for movies and TV among us and making music about the city and the world we all live in. During Saturday’s performance, Hana Kim’s 360 degree visuals were of escalators and other urban images layered over our heads like a digital circus performance. The gritty tune called “O Guerreiro Espiritual” is an upbeat piano tune with a funky bass line. Peter glides through chromatic scales on his Steinway and seems to get the piano to release its voice from way up high to way down low. The Refractor Piano is an amazing invention that can be used so many different ways. “Black Stone Paths” starts out with Peter creating a soundscape from tapping on the strings of the piano with mallets. Hana Kim’s visuals were also swirling in a 360 during at the start of this number. Peter mentioned that no two performances are ever the exact same with the Refractor Piano. Depending on the vibe at the venue, what time of year, how Peter is feeling, how the audience is feeling, etc, he creates in real time. Like a DJ stoking a nightclub crowd, Peter is composing, mixing and vibing from the energy. 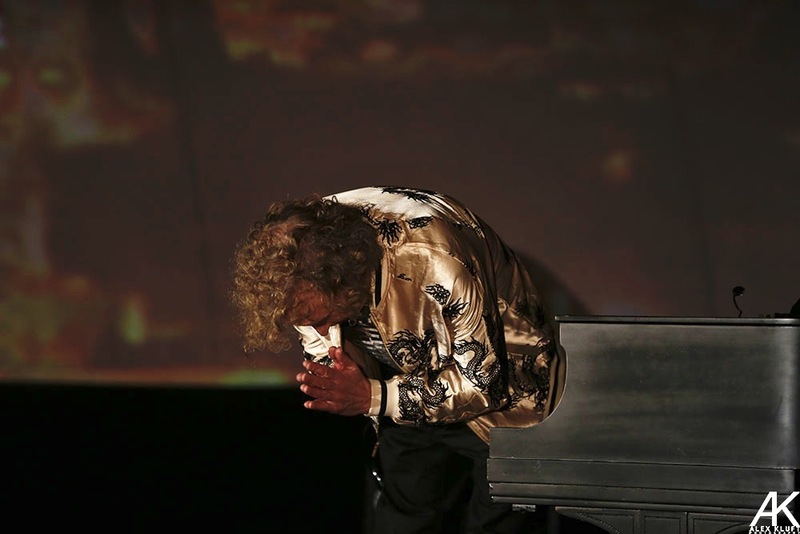 He, like the audience, sees the 360 degree visuals and the performance reflects these feelings. “Fireflies in Orbit” is an amazing tune. The piano’s melody sounded Stravinsky like with a lower synthesizer bass-sounding line providing the rhythm. Hana Kim’s visual are not only things that look like firefly’s, but also what it might look like if you actually ARE a firefly. Once again the full range of the Refractor Piano can be heard on this piece. The Steinway got a full work out as highs and lows were refracted like a prism refracting glass. A full rainbow of sounds and music. Watching a Peter Manning Robinson concert up close is a unique and inspiring experience. It was such a pleasure to listen and watch someone make music that is truly original and assemble that music right in front of you. If you get a chance to attend a Peter Manning Robinson concert, I highly recommend it.